Banana pudding pie is own version using corn flakes of that retro sweet favourite. The digestive biscuit and corn flakes are crumbled and made into crust, which is topped with homemade custard. 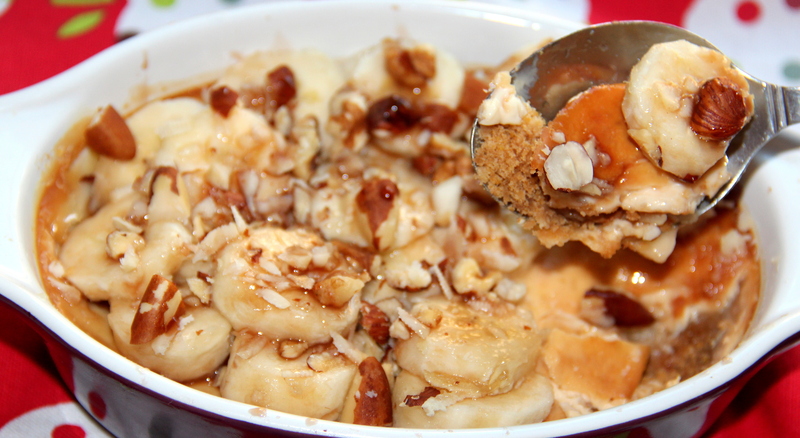 Baked and topped with bananas and nuts. Dissolve corn starch with 2-3table spoon of milk and set aside. Place cream, honey in a sauce pan and bring it to boil. Once the mixture thickens take off the flame and cool it completely. Combine biscuit crumbs, powdered corn flour and vegetable fat in a bowl, mix well. Grease a pie/tart pan press the crumb mixture to about ¼” thickness, being sure to cover bottom and sides of pan. Pre-heat the oven at 180deg c.
Pour the cooled custard mixture on top of the crumb layer and bake in the pre-heated oven for 15-20minutes/ until the custard is slightly browned. Brush lemon juice on to the slices, sprinkle some nuts. Posted on September 4, 2014, in Dessert, Indian, International, Kids recipes, Sweets. Bookmark the permalink. 14 Comments. After tasting this I fell in love …Thanx a bunch. ..glad you liked….have a lovely day Katherine. .. Using cornflakes is genius, Chitra! Thanx for your compliments it make me feel good and encouraged but am a learner and learning a lots from blogger friends like yourself….thanx again. ..